One of the benefits of living in Oregon is our availability to fresh, tart cranberries. Oregon’s coastal region’s moist bogs provide ideal conditions for the spindly, low growing bushes to thrive. courtesy oregon cranberry growers assn. Their juicy tanginess makes an ideal foil in sauces, chutneys and other condiments, in salads, and for baking. I like to stock up on cranberries when they are abundant, from October to December. I recently came across a forgotten bag of berries stuffed in the recesses of the fridge that needed to be either frozen or used up. Here’s my ten minute solution: a sweet and sour cranberry-apple jam that falls somewhere between jam and chutney. The jam’s spicy-tart bite is a delicious wake-up on morning toast, as an edge with peanut butter in a sandwich, and even as a mild condiment with curries. Nice to know it is laced with B, C and E vitamins, too. In a medium pot, combine cranberries, apple, cider and vinegar, sugar, salt and five-spice and bring to a boil over high heat, stirring to dissolve sugar. If using vanilla extract hold off until finish to add. 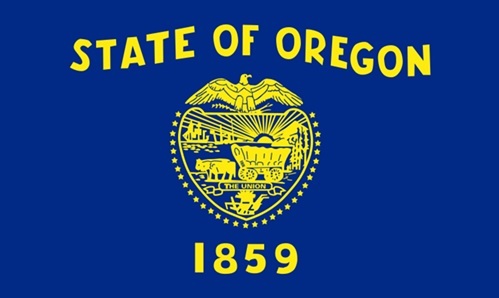 The state capitol was abuzz with activity yesterday in celebration of Oregon’s 158th birthday. We were one happy family: visitors, locals and various groups gathered shoulder to shoulder with our legislators. Smiles were broadly shared and cake was enjoyed by all; a far cry from the chaos running concurrently on the federal level. Here’s a little bit of trivia I unearthed, a claim unique to our state. It’s one more reason why this is such a special place to live. Did you know the humongous fungus of eastern Oregon is regarded as the largest single living organism in the world? That’s right, the ancient fungus has tentacles that can spread underground for acres and has been known to weigh well over 20,000 pounds! Disclaimer: since Culinary Distractions is primarily a place of food topics and interest, there will be no shared photos of this humongous fungus here, just the facts. On the food side, I’d rather focus on the prettier more edible mushroom that reside in Oregon. Many have been discussed previously here, so today we will stay with the ubiquitous cremini. Creminis are great all-purpose mushrooms; they are firm, throw off little liquid when cooked, and have superb flavor. 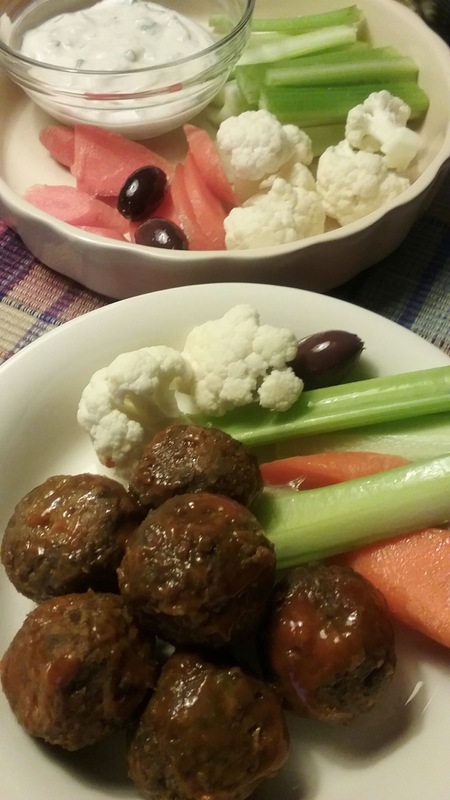 This vegetarian meatball variation was a surprise hit at a recent Super Bowl spread. The combination of cremini mushrooms and cannellini beans holds together amazingly well, creating a flavorful canvas for other sauces. The tasty balls are bathed in a zippy Buffalo Wing Sauce and the standard chicken element is hardly missed! In food processor bowl, place beans, sliced mushrooms, garlic, smoked paprika, coriander, cumin, salt and pepper. Cover; process with on-and-off pulses about 45 seconds, until coarsely chopped. In bowl stir bean mixture with egg and panko bread crumbs. Shape into about 24 – 1 inch balls with hands. Can be chilled at this point up to 1 day ahead; pack balls tightly together to hold shape. Oil a baking sheet and arrange the balls close together; bake at 400° F. 25-30 minutes, turning once or twice until firm and cooked through. Meanwhile prepare Buffalo Wing Sauce: heat butter until bubbly, add the wing sauce and soy sauce, stirring until bubbly and smooth. Place the hot balls in a large bowl, pour the sauce over and gently toss to coat well. Serve with blue cheese dressing and fresh vegetables. Makes about 24 balls. In Oregon’s emerging truffle industry, I feel like a newcomer to the party. 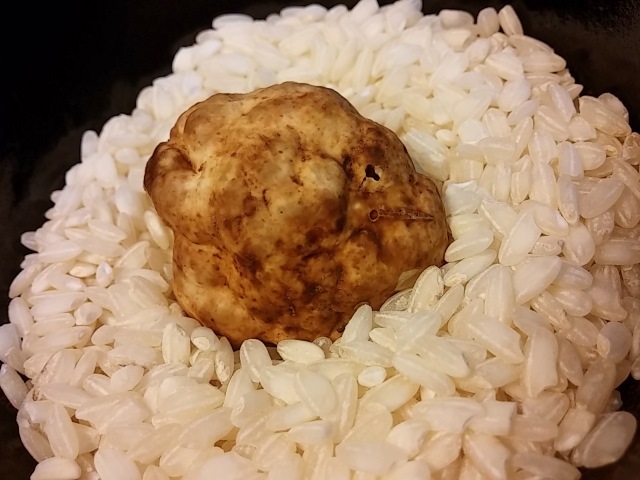 Admittedly, this truffle season I finally experienced my first cooking session with these quirky characters, legendary for their aphrodisiacal attributes. At my local Roth’s market, I spotted a small collection of the knotted balls of excess on display, marked $199 lb. According to “D”, our produce manager, the white truffles were provided by a reliable local purveyor who’s very tight lipped about their actual location in the wild. At that price, he should be. “D” suggested shaving them over a light pasta dish. With white truffles, it seems much of their musky ephemeral garlic-like attributes are linked to their aroma, which can be fairly fleeting. Thus, peppering the top of the dish, allows the most extreme up-close-and-personal olfactory sensation. Since the heat of the pasta would cause the aroma to drift upward, salad would be deferred to a later date. Truffles have an affinity to butter and cream, too. Many of the dishes from Italy’s Piedmont region and specifically Alba, where truffles go for thousands of dollars a pound, are prepared quite simply. Often pasta is tossed in a butter sauce seasoned with Parmesan. Fresh truffle is then shaved on lavishly in front of the salivating guest. My solution was a little different. 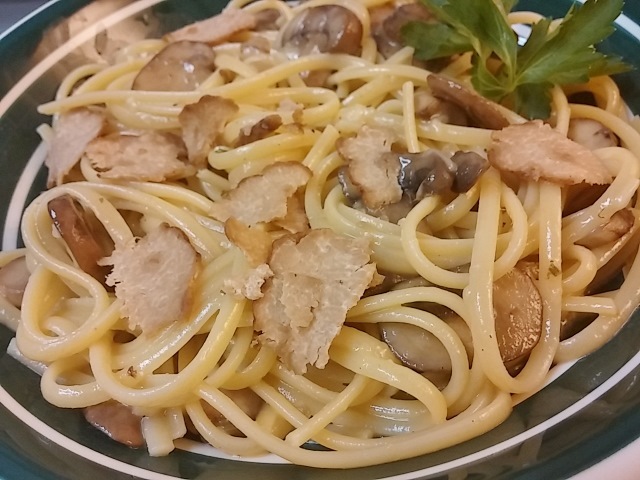 I took my old Pasta Carbonara, deleted the bacon, sautéed local mushrooms in a small amount of butter, tossed in the hot pasta, and added raw egg with Parmesan cheese to make a light sauce. In a large sauté pan, heat the butter, add the shallot and garlic and cook until transparent, about 5 minutes. Add the mushrooms, herbs, salt and pepper, and sauté until the mushrooms soften and begin to release their juices. Remove the garlic. In a small bowl, beat the eggs and add half of the Parmesan cheese.